Hello! Why the price of premium + account is 229 RUR (my friend payed 169RUR this month) and why there were no free 30 days trial for me? 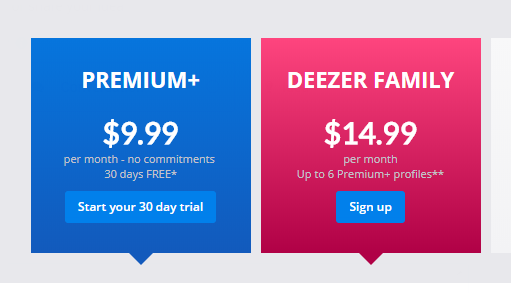 I'm excited to switch to Deezer; I just registered for a trial, but the final payment says it will be $12.99 monthly! On your site it says Premium+ is $9.99, which is what was was advertised. How to correct this? Should I cancel my account and restart? Is there a way to change my payment plan? Will do as you suggest. hello my paypal was playing up which means I missed one payment to deezer last week. I have been a premium customer since 2015. And I have a family account. Now I’m told I must re subscribe and it’s now going to cost £17.99 if I’m not able to get it for the original £14.99 then I will just go to Spotify. I'd like to confirm my monthly payment ..how much is it ? And why it's ($13.15) not $9.99? Did you pay via apple store ? My subscription ended because my credit card expired. I want to upgrade to the family subscription £14.99 and update my payment details. When I click on subscription in my browser nothing happens other than a window with identical content opening.. It just goes in the loop there is no option to actually enter my credit card details subscription. My iOS app offers the same subscription for £17.99 e.g. it's more expensive! Paid 12.99 through itunes however I used to pay £9.99 what happened did prices go up?!? I even received my invoice . Payment confirmed . Hi @Dneecy , one is iTunes and the other one is Deezer's price please see above. Hello there is the difference! Could you please sort it out! I paid via app but then your webpage gives 3SGD lower price...!